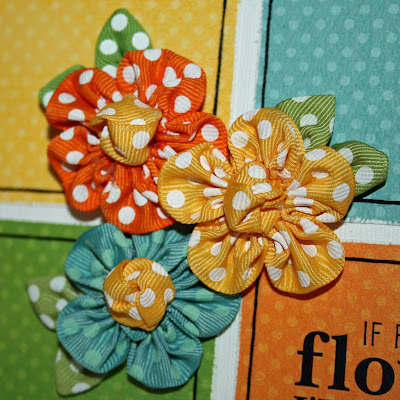 Today, I want to show you how to use your Double Dotscraps to make really fun and easy flowers! 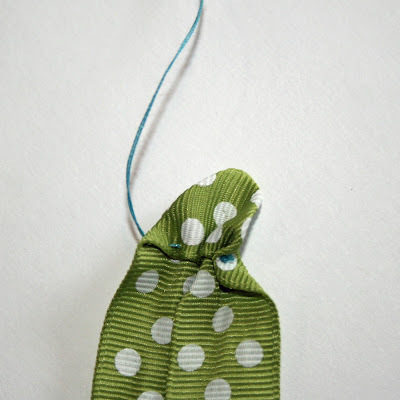 These are really quick and after the first one, you won't take more than a few minutes to make one. Here is a card that I made with Double Dot Scraps. I decided to make my tutorial using several pictures so that you could see each step clearly and be able to refer to it, if needed. The first thing you need to do is cut a 9 1/2 inch strip of Double Dot Ribbon. You are going to fold it accordian style, as shown. You need to end up with 5 equal folds for 5 petals. Each fold is approximately 1 3/4 inches. Run your fingernails along each fold line. When you open the ribbon, you will be able to see each of the 5 petals. It will look like this. 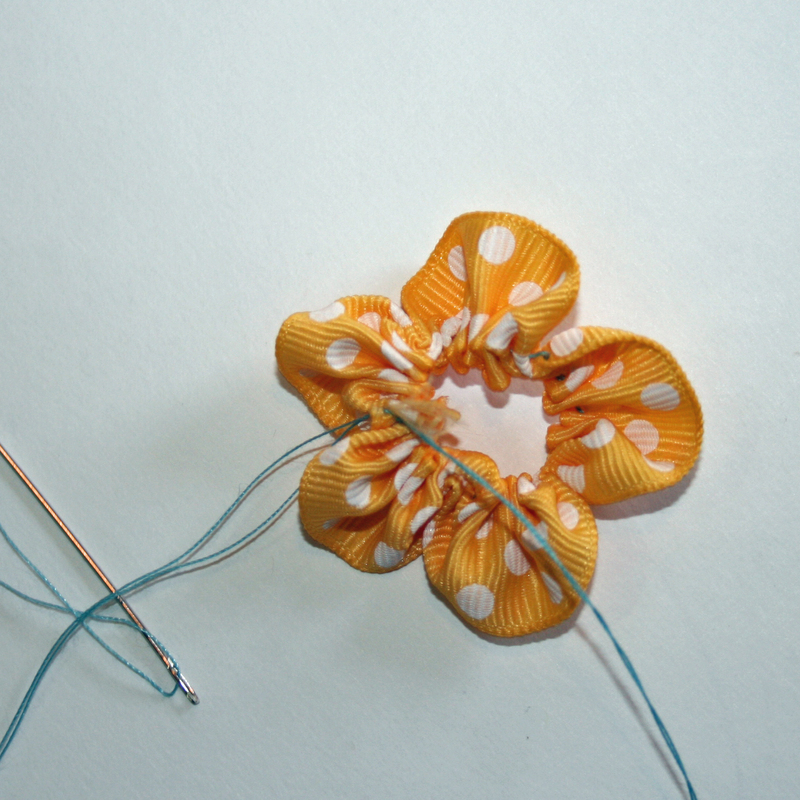 Now, you are going to make each of the petals by stitching, as shown. I have used blue thread so that you can clearly see the shape. 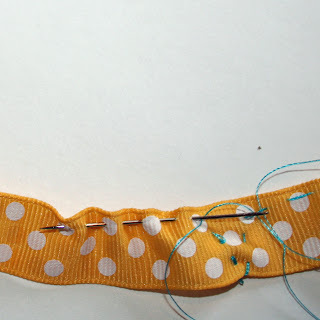 You will want to use thread that is more closely matched to the ribbon if possible. You also want to make sure that your thread is a strong one. I just used regular thread, so I doubled it. Do NOT use embroidery floss. It will break, trust me! Here is the trick to making each petal shape. When you get to the bottom of the stitches on one petal, you need to go 'under' the ribbon with a stitch before you start the next petal. After all five petals are stitched, your ribbon will look like this. (same picture!) Notice that this is not an exact science. Close to this is good enough! 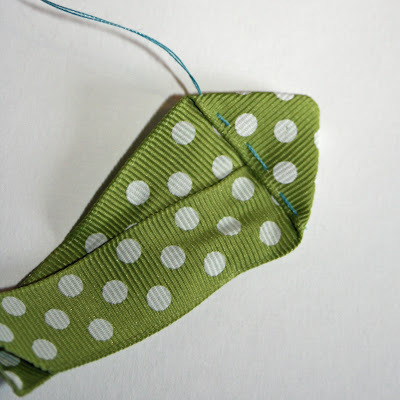 GENTLY pull your thread from both edges to gather it. As you are gathering, you will see your petals start to appear. After it's gathered, simply tie the ends of your thread together. That's it! 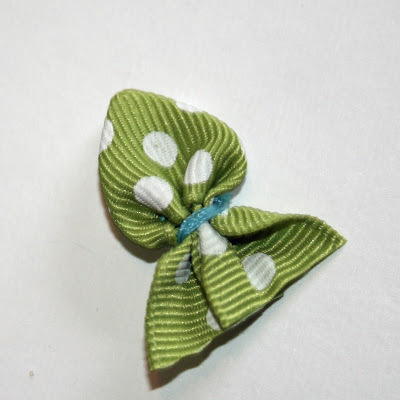 You have an easy ribbon flower! Note: I didn't gather this one tightly so you could see how it pulls together easier. Here is a close-up of the finished flowers. 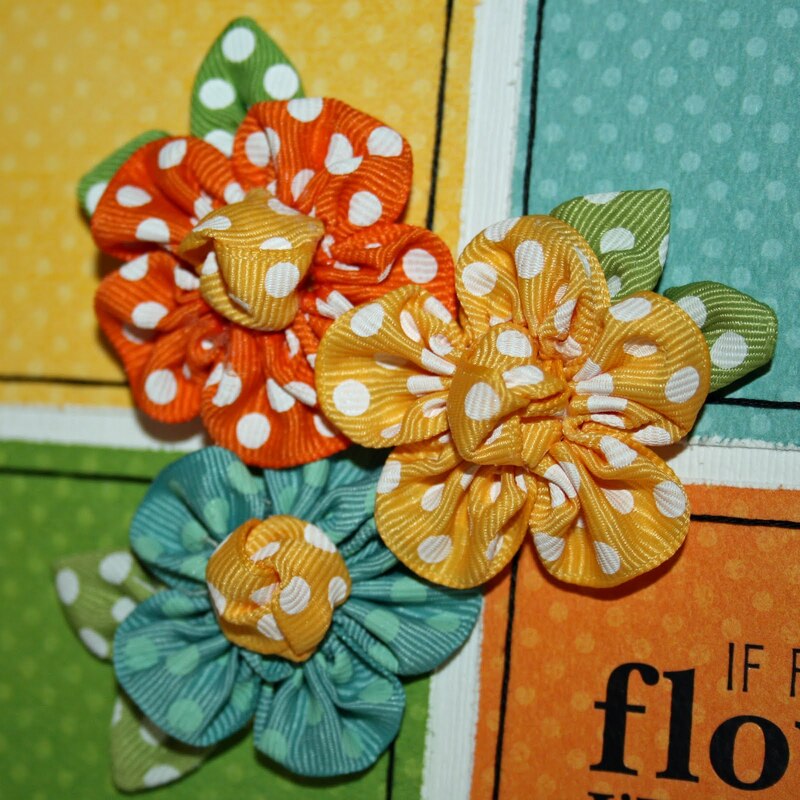 For the centers of these, I just tied a little knot in a small piece of ribbon, tucked the ends under and then glued it to the center of each flower. You could also just add a brad or trinket to the centers. Did you notice the little ribbon leaves? They are even EASIER! All you need is about 3 or 4 inches of Double Dot Ribbon. 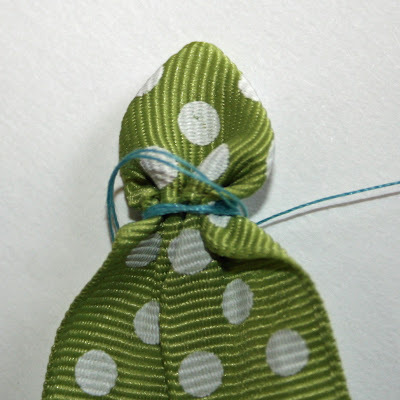 Fold and stitch as shown. All stitches start and end on the top of the leaf. Be sure to catch the fold into your stitches. Now, pull up the stitches to gather. 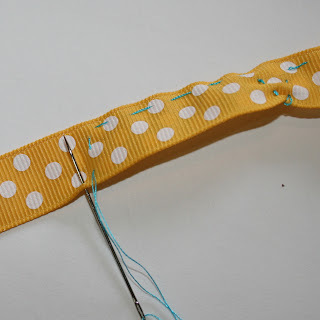 Wrap the thread around the stitched area a couple of times and then knot it in the back. 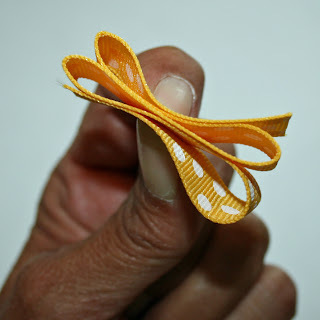 Trim the excess ribbon from the ends. 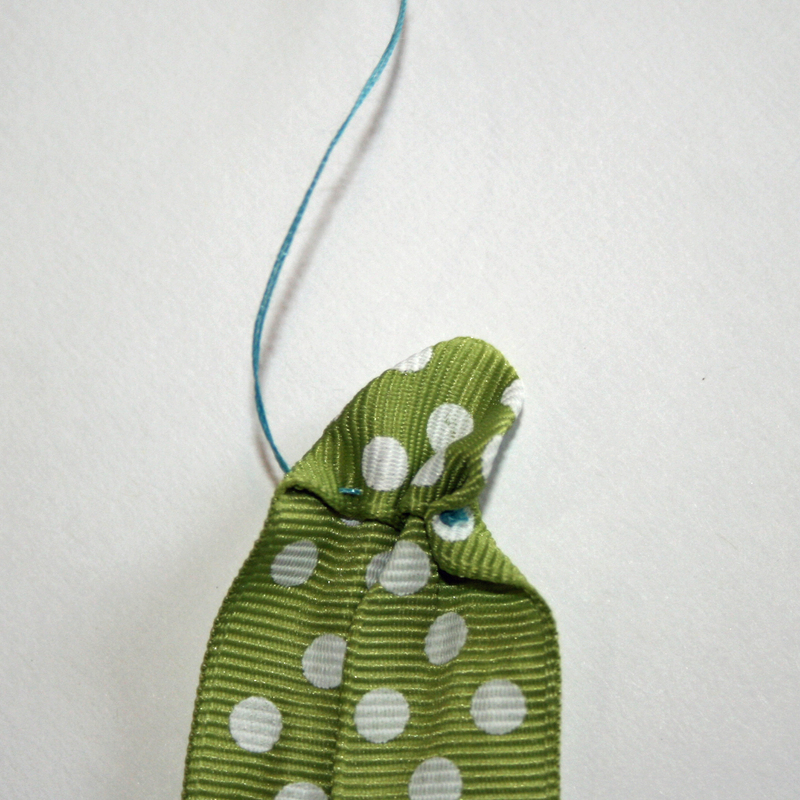 Be sure to leave a bit of ribbon to attach the leaves underneath the flower. Just use glue dots to hold them in place. That's it! Super Simple! Now it's your turn to give it a try! One more hint before you go... I like to glue my flowers and leaves to a little punched circle. Then I can move them around to my heart's content. 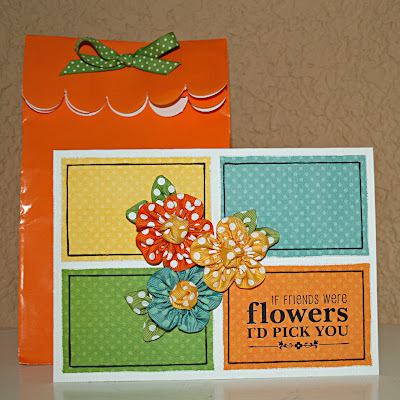 When you have them where you want them, just use a glue dot to attach them to your page!